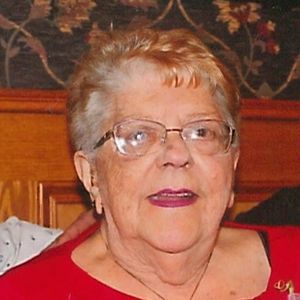 Yvette (Pilotte) (Deneau) Searles, 80, died April 7, 2019 at Community Hospice House in Merrimack due to failing health. She was born in Manchester, NH on February 25, 1939 to the late Oscar and Claudia (Vaillancourt) Pilotte. A lifelong resident of Manchester, Yvette was a 1957 graduate of St. George High School. She last worked at St. Mary's Bank until she was forced to retire due to illness. She enjoyed being a loving mother and grandmother (mémère). She is survived by her son, Brian Deneau; her daughter, Shelli Ladd and her husband David; four grandchildren, Janelle and Nicole Deneau and Alecia and Ryan Ladd; her brother, Richard Pilotte and wife Lorraine; two sisters, Rita Bernier and Pauline Eafrati and her husband Louis, as well as many nieces and nephews. Services will be on Friday, April 12th with a gathering from 2-4 and a memorial service at 4pm at Phaneuf Funeral Homes and Crematorium, 243 Hanover Street, Manchester, NH. Add your thoughts, prayers or a condolence to Yvette's guestbook.